Gluten-specific T cells in the small intestinal mucosa are thought to play a central role in the pathogenesis of celiac disease (CD). The vast majority of these T cells recognize gluten peptides when presented by HLA-DQ2 (DQA1*05/DQB1*02), a molecule which immunogenetic studies have identified as conferring susceptibility to CD. We have previously identified and characterized three DQ2-restricted gluten epitopes that are recognized by intestinal T cells isolated from CD patients, two of which are immunodominant. Because almost all of the gluten epitopes are restricted by DQ2, and because we have detailed knowledge of several of these epitopes, we chose to develop peptide-DQ2 tetramers as a reagent to further investigate the role of these T cells in CD. In the present study, stable soluble DQ2 was produced such that it contained leucine zipper dimerization motif and a covalently coupled peptide. We have made four different peptide-DQ2 staining reagents, three containing the gluten epitopes and one containing a DQ2-binding self-peptide that provides a negative control for staining. We show in this study that peptide-DQ2 when adhered to plastic specifically stimulates T cell clones and that multimers comprising these molecules specifically stain peptide-specific T cell clones and lines. Interestingly, T cell activation caused severe reduction in staining intensities obtained with the multimers and an Ab to the TCR. The problem of TCR down-modulation must be taken into consideration when using class II multimers to stain T cells that may have been recently activated in vivo. Major histocompatibility complex tetramers consist of four MHC molecules loaded with a single peptide and bound to a streptavidin molecule that is coupled with a fluorogenic marker (1). Multivalent engagement of MHC molecules leads to a stable binding of the tetramer to TCRs on the T cell surface, which allows direct visualization of the T cells. Importantly, sufficient affinity between the TCR and peptide-MHC molecules appears to be achieved only by T cells that express TCRs specific for the particular peptide-MHC complex. MHC tetramers have predominantly been applied in studies of CD8+ T lymphocytes (reviewed in Refs. 2 and 3). This class I tetramer technology has had a profound impact on our understanding of the biology of the CD8+ T cell immune response to viruses and tumors. In contrast, only a few studies with murine MHC class II tetramers have been reported (4, 5, 6, 7, 8, 9) and only recently have data from human class II tetramers been published (10, 11, 12, 13, 14, 15). HLA class II molecules are implicated in susceptibility (and resistance) to many severe autoimmune diseases such as type I diabetes, rheumatoid arthritis, multiple sclerosis, and systemic lupus erythematosus (16). The generation of appropriate class II tetramers could provide valuable new insights into the role CD4+ T cells play in these chronic diseases. However, the development of such technology is hindered by the lack of knowledge about which Ags and T cell epitopes play a role in human autoimmune diseases. One exception is celiac disease (CD),3 an HLA-associated disease where an abnormal immune response to wheat gluten drives pathology in the small intestine (17). Gluten peptides have been identified that are recognized by CD4+ T cells isolated from the intestines of CD patients (18, 19, 20, 21). The relevance of these T cells to disease is clear, because the majority are restricted by HLA-DQ2 or -DQ8 (22, 23), the same two molecules that have been identified as conferring susceptibility to CD using immunogenetic approaches (17). Identification of the epitopes recognized by the intestinal T cells in CD is complicated by the complexity of the gluten Ag, which is made up of alcohol-soluble α-, γ-, and ω-gliadins and alcohol-insoluble glutenins. Three DQ2-restricted gliadin epitopes have been characterized to date, and for each of them conversion of specific glutamine residues improves their binding to DQ2 and is critical for their recognition by intestinal T cells (18, 21). Interestingly, this modification is thought to be mediated in vivo by the enzyme tissue transglutaminase (24), an enzyme which is also the major target of autoantibodies in CD (25). Two of the gliadin epitopes stem from α-gliadin (α-I and -II), and these appear to be major epitopes, as all patients tested so far responded to at least one of them (21). The third gliadin epitope is derived from γ-gliadin (γ-I) and is more infrequently recognized by patients (17, 18). Because it is clear that these well-characterized peptides play a role in the T cell response to gluten, and because they are all restricted by the same HLA molecule, this system lends itself well to testing the class II tetramer technology in a human disease setting. In this study we produced soluble DQ2 molecules in the baculovirus expression system for the purpose of peptide-DQ2 tetramer generation. The DQ2α and DQ2β chains were engineered to ensure stable formation of soluble DQ2 molecules with covalently linked peptide. We succeeded in expressing soluble peptide-DQ2 complexes that, when coated onto plastic, efficiently stimulated T cell clones (TCCs). Moreover, by incubating these enzymatically biotinylated peptide-DQ2s with streptavidin-R-PE (SA-R-PE) we were able to generate tetrameric and multimeric complexes that we refer to in this study as peptide-DQ2 multimers. Using a panel of peptide-specific TCCs and lines derived from CD patients, we demonstrated that the peptide-DQ2 multimers stained T cells in a peptide-specific manner. However, we observed a dramatic loss of multimer binding to Ag-specific T cells after antigenic challenge, due to an extensive down-modulation of the TCRs. This phenomenon must be taken into consideration when using peptide-DQ2 multimers to stain T cells of active celiac lesion, and has serious implications for the use of class II multimer reagents in general. cDNA of DQA1*0501 and DQB1*0201 (generously provided by A.-K. Jonsson, Swedish University of Agricultural Science, Uppsala, Sweden, and B. Mach, University of Geneva Medical School, Geneva, Switzerland, respectively) were truncated by PCR and added to fos and jun encoding sequences in a TA vector (generously provided by L. Fugger, Aarhus University Hospital, Aarhus, Denmark). These constructs, which were originally used for the expression of empty recombinant DQ2 molecules (G. Paulsen, L. Fugger, and L. M. Sollid, unpublished observations), were further modified for our purpose. A factor Xa site was introduced between the DQ and the fos segment by megaprimer PCR using the DQA1*0501-fos construct as template. BglII sites were introduced on both sides of the complete DQA gene to be able to introduce the gene into a BglII restriction site of the baculovirus expression vector. The amplified and modified DQA gene was cloned into pMOSBlue vector and sequenced. A synthetic gene encoding the native DQB leader peptide, the sequence encoding a flexible linked peptide, the 3′ DQB extracellular region with a factor Xa site, the jun motif, and a birA site (26) were purchased from Operon Technologies (Alameda, CA) (Fig. 1⇓). 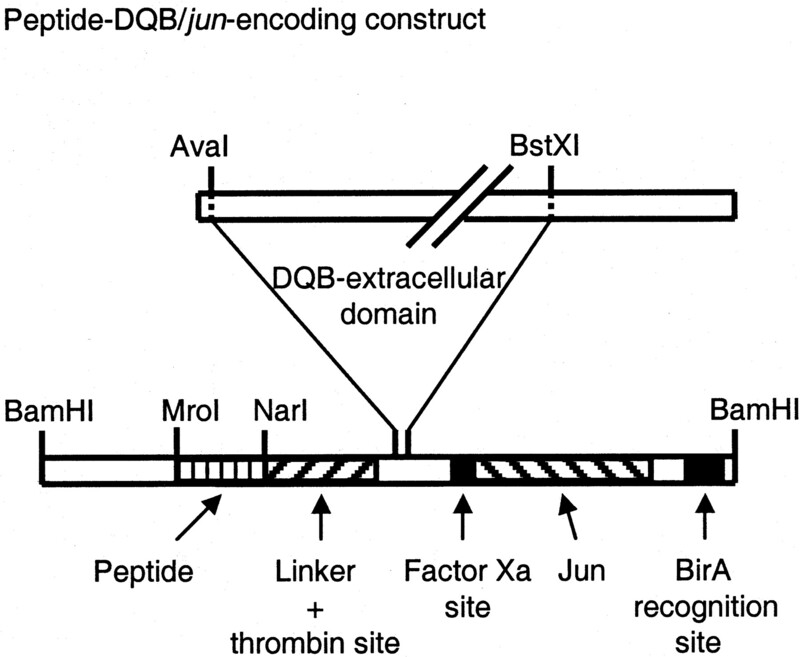 The 15-aa-long linker (GAGSLVPRGSGGGGS) included a thrombin site. The synthetic gene was flanked by BamHI sites which were exploited to clone into the BamHI sites in a modified pGEM-112f+ plasmid DNA vector in which the AvaI site had been removed. The major part of DQB was excised and purified from the TA vector by AvaI/BstX digestion. This fragment was then inserted into AvaI/BstX sites included in the synthetic gene as shown in Fig. 1⇓. Constructs for the generation of modified DQβ chains. The gene sequence encoding the extracellular domain of the DQβ chain was cloned into a vector pGEM-11Zf+ plasmid DNA vector containing a synthetic gene. The synthetic gene included regions encoding the native DQB leader peptide, the sequence encoding a flexible linked peptide, and a part of the 3′ DQB extracellular region engineered to encode a factor Xa site, the jun motif, and a BirA site. The 3′ MroI and 5′ NarI sites were used to exchange the codons corresponding to the peptide. Hybridized oligonucleotides encoding three other peptide sequences with single strand overhang complementary to those of the MroI/NarI digested gene construct were ligated into the vector one at a time. The four different peptide-DQB genes were verified by sequencing. Finally, the engineered DQA and DQB genes were cloned into BglII and BamHI sites under control of two back-to-back p10 promoters of the baculovirus transfer vector pAcAB3 (BD PharMingen, San Diego, CA). Correct orientation of the genes was confirmed by restriction digestion analysis. The DQA- and DQB-carrying pAcAB3 plasmid was cotransfected with linearized baculovirus DNA (BD PharMingen, BaculoGold kit 21100K) into Sf9 insect cells according to the manufacturer’s recommendation. One or two rounds of plaque purification generated clonal virus isolates. High-titer virus stocks were produced in Sf9 cells and used to infect the serum-free, suspension expresSF+ cell line (Protein Science, Meriden, CT). Spinner cultures of 1.5–2.0 liters in total were infected at a concentration of 2.5 × 106 cells/ml with a multiplicity of infection of 3–5. Supernatants harvested at day 4 or 5 were affinity-purified using the mAb 2.12.E11 (27), coupled, and cross-linked to protein A-Sepharose beads. Soluble peptide-DQ2 molecules were eluted at pH 11.5 with 50 mM of diethylamine containing 0.15 M of NaCl and immediately neutralized using 2 M of Tris (pH 6.2). Buffer exchange (PBS 0.02% NaN3) and concentration of eluates were performed in Vivaspin centrifugal concentrators (cutoff 10,000; Vivascience, Binbrook Lincoln, U.K.). The protein content was determined by the bicinchoninic acid method (Pierce, Oud-Beijerland, The Netherlands) and purity was confirmed by SDS-PAGE under reducing conditions. Briefly, cells were isolated from small intestinal biopsies from DQ2+ CD patients that had been challenged overnight with pepsin/trypsin-digested gliadin (T cell line (TCL) CD 429, 430, 431), chymotrypsin-digested gliadin (TCL CD 433), or pepsin/trypsin-digested gluten (TCC CD 380). The TCL CD 444 was generated from biopsies that were not challenged ex vivo with gluten or gliadin. Isolated cells were cultured with 1 × 106 autologous, irradiated PBMC and 5–10 IU/ml recombinant human IL-2. Expansion of TCL was done with 1 μg/ml PHA (Murex Diagnostics, Dartford, U.K.), 5 IU/ml IL-2, and allogeneic, irradiated PBMC. TCCs were established from peptide-specific TCL by seeding 0.3–1.0 T cells/well in 20-μl wells in the presence of 2 × 104 allogeneic, irradiated PBMC, 1 μg/ml PHA, and 5 IU/ml IL-2. The TCCs and TCLs tested were isolated from different CD patients. The TCLs analyzed were selected toward being reactive to all three gliadin epitopes. The generation of TCC 4.66, a sister clone of TCC 4.32, and the TCC CD 380 is reported elsewhere (21, 22). We generated a negative control TCL (TCL CTRL) by challenging intestinal biopsies from a DQ2+ individual not having CD with human astrovirus serotype 1, and the cells were expanded following the same protocol as described above. Soluble DQ2 molecules in PBS 0.02% NaN3 were adsorbed to flat-bottom 96-well plates (Costar, Corning, NY) at the given concentration in triplicates by overnight incubation at 4°C (100 μl/well). The wells were washed three times in medium before 5 × 104 TCCs were added in 200 μl of culture medium (RPMI 1640 (Life Technologies, Paisley, Scotland) and 15% pooled, inactivated human serum). In the cases of peptide stimulation of TCLs, 3–5 × 104 T cells were added to 5 × 104 irradiated (80 Gy) APC (DQ2+ B-lymphoblastoid cell line) which had been incubated overnight with different peptide dilutions in triplicates, at a total volume of 150 μl of culture medium. T cell proliferation was measured as [3H]thymidine incorporation 72 h after stimulation. All assays were performed twice with similar results. For the experiments shown in Fig. 6⇓, 5⇓ × 104 TCC 4.66 were mixed with 1 × 105 irradiated APC (DQ2+ B-lymphoblastoid cell line) that had been incubated overnight with peptide in a 96-well plate. Wells were harvested in triplicates at days 1 (16 h after stimulation), 2, 3, 5, and 8 for analysis by flow cytometry. Peptide-DQ2 molecules were biotinylated with BirA enzyme (Avidity, Denver, CO) in 10 mM of Tris-HCl (pH 8). The peptide-DQ2 molecules at concentration of 1–2 mg/ml were incubated with BirA (Avidity) at a concentration of 10 μg/ml in room temperature overnight in a biotin-containing buffer provided by the manufacturer. Unbound biotin was removed and buffer was exchanged with PBS containing 0.02% NaN3 by centrifugal concentrators (Vivascience; cutoff 10,000). The biotinylation efficiency was estimated by ELISA quantification of DQ2 molecules before and after removal of biotinylated protein with streptavidin-agarose (Pierce). Typically >95% of the DQ2 molecules were biotinylated. 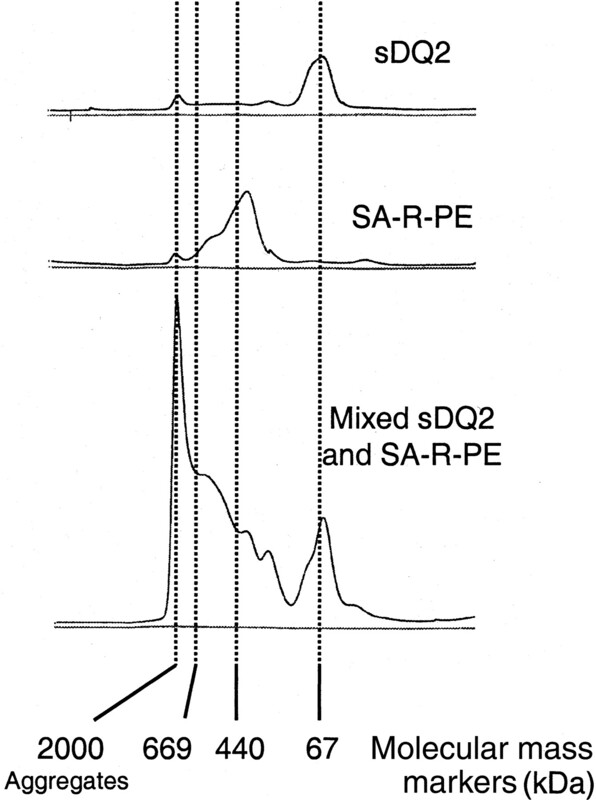 Biotinylated peptide-DQ2s were incubated with 70% of SA-R-PE conjugate (Molecular Probes, Eugene, OR), giving a final 6:1 molar ratio (DQ2: SA-R-PE) at room temperature for 2 h in the dark. Thereafter, the rest of the SA-R-PE conjugate was added and incubated for another 2 h before storage at 4°C. The peptide-DQ2 staining reagent gave stable staining for months. Soluble peptide-DQ2 molecules, SA-R-PE conjugate, or a mix of these two reagents (prepared as when generating peptide-DQ2 multimers) was analyzed by size exclusion fast protein liquid chromatography on a Superdex 200 (Amersham Pharmacia Biotech, Uppsala, Sweden) column. Pellets of 1–5 × 105 T cells were incubated in 30 μl of DQ2 multimers at a concentration of 30 μg/ml (RPMI 1640, 5% FCS, 0.1% NaN3) for 30 min at 37°C. Prior to staining of the cells with other surface markers (FITC anti-CD4 (clone SK3), PE anti-CD4 (clone SK3), FITC anti-αβTCR (clone WT31); BD Biosciences, San Jose, CA), they were chilled for 5 min, supplemented with staining reagents for 30 min, and subsequently washed twice before analysis by flow cytometry. The TCCs in Fig. 4⇓ were stained directly after thawing, whereas the TCLs in Fig. 5⇓ were stained either directly from culture or after thawing. The analyses of multimer staining were performed on FACSort or FACSCaliber instruments (BD Biosciences). Soluble DQ2 molecules were expressed in the baculovirus expression system with the transmembrane DQα and DQβ regions replaced by fos and jun leucine zipper dimerization motifs, respectively (28). To further facilitate assembly of DQ2 dimers, and to ensure complete loading of desired Ag in the binding site, the soluble DQ2 molecules were produced with peptides covalently linked to the DQ2β chain (29, 30). Using this approach we made soluble DQ2 molecules with four different peptides (Table I⇓). Three of the peptides were antigenic gliadin T cell epitopes (γ-gliadin I, α-gliadin I, and α-gliadin II) while the fourth was an endogenous self-peptide eluted from DQ2 which derives from the HLA class I H chain and is known to bind to DQ2 with a high affinity (control-DQ2) (31, 32). The peptide-DQ2 molecules were expressed in expresSF+ serum-free cells in spinner cultures. We chose this particular cell line to avoid contamination of serum proteins after purification and because the cells were easy to grow in 300-ml spinner cultures. The expression of α-I-DQ2, α-II-DQ2, and γ-I-DQ2 was typically around 0.25–0.4 mg/L, while the control-DQ2 expression was only 0.1–0.2 mg/L of cell culture. Affinity-purified DQ2 molecules with covalently attached peptides were coated onto plastic and tested to see whether they could specifically stimulate TCCs derived from the intestines of CD patients. Two unrelated TCCs were tested for each of the α-I-DQ2 and α-II-DQ2 molecules, whereas only one TCC was available for testing the soluble γ-I-DQ2 preparation. All TCCs responded to the cognate immobilized peptide-DQ2 complex (stimulation of one TCC of each specificity is shown in Fig. 2⇓). The stimulatory capacity of the soluble gliadin peptide-DQ2 complexes compared well with the stimulation seen when peptide-pulsed APCs were used (data not shown). Stimulation of TCCs by immobilized soluble peptide-DQ2 complexes. TCCs specific for each of the three gliadin epitopes (γ-I, α-I, and α-II) were tested for stimulation by immobilized peptide-DQ2 carrying the epitope they are known to recognize (filled symbols) and control-DQ2 complexes (open symbols) at different concentrations. Peptide-DQ2 molecules were biotinylated at a single site in the C-terminal tail of the DQβ chain and then used to generate PE-labeled tetrameric complexes on a streptavidin backbone. Optimal staining with tetramer staining reagent is obtained when all streptavidin molecules are complexed with four peptide-MHC molecules (6). To achieve this, we used a MHC:streptavidin ratio of 6:1. In addition, 70% of total streptavidin used was preincubated with the peptide-DQ2 molecules before the rest of the streptavidin was added and the incubation was extended. The step-wise incubation was performed to optimize the excess of DQ2 molecules able to bind streptavidin. We used SA-R-PE conjugate from Molecular Probes for generation of the peptide-DQ2 staining reagents. The main fraction of the SA-R-PE eluted as conjugates of molecular mass lower than 440 kDa when subjected to Superdex 200 gel filtration (Fig. 3⇓). This indicates that most SA-R-PE conjugates consist of only one PE molecule of 240 kDa and that no significant amounts of free streptavidin molecules were present. Gel filtration of the peptide-DQ2 staining reagent demonstrated that a fraction eluted as complexes of between 440 and 660 kDa and, in addition, parts of the reagent eluted in the void volume as aggregates (Fig. 3⇓). When aggregates and complexes were separated, both stained T cells specifically and in a similar manner to the staining given by unseparated reagent (data not shown). Therefore, the reagents were used in an unseparated form in all additional experiments and are referred to as peptide-DQ2 multimers. Gel filtration profiles. The profiles obtained when soluble DQ2 (upper panel), SA-R-PE (middle panel), and the product of these two reagents incubated together (lower panel) were subjected to Superdex 200 gel filtration. Reference molecular mass markers were: blue dextran (2000 kDa), thyroglobulin (669 kDa), ferritin (440 kDa), and BSA (67 kDa). All peptide-DQ2 multimers were used at the same concentration (30 μg/ml) for staining at 37°C. To determine the appropriate incubation time for multimer staining, the γ-I-specific TCC 4.66 was stained with γ-I- and control-DQ2 multimers for 5, 15, 30, and 60 min. Optimal staining was observed with incubation between 15 and 30 min (Fig. 4⇓A). All further staining experiments were incubated for 30 min. The specificity of the peptide-DQ2 multimers was analyzed by staining a panel of well-characterized gluten peptide-specific TCCs. Peptide-DQ2 multimers stained TCCs in accordance with their known peptide specificity (Fig. 4⇓B). The TCCs displayed no cross-reactivity when noncognate peptide was presented by APC (data not shown), and likewise no cross-reactive staining was observed with multimers of other gluten specificities. Several additional TCCs were also stained by the peptide-DQ2 multimers in a specific manner. Interestingly, while the intensity of staining remained the same for the same T cell stained on different occasions, it varied among TCCs of the same specificity. This was not due to different cell-surface expression levels of the TCR, as staining these T cells with a TCR-specific Ab gave almost identical results (data not shown). All the T cells used were expanded by cyclic weekly mitogenic restimulation, and they were always applied in assays in a nonproliferating state 8 or 9 days after the last stimulation. Thus, the differences in staining intensities are not likely to be caused by dissimilarities in activation status of the T cells. The differential staining may thus reflect differences in affinity of the TCRs from the different T cells for the same peptide-DQ2 complexes. We also stained several TCLs derived from the intestines of CD patients to assess the ability of the gliadin-DQ2 multimers to stain distinct populations in a more heterogeneous cell population (Fig. 5⇓ and Table II⇓). We demonstrated that the number of positive cells of heterogeneous TCLs with particular gliadin-DQ2 multimers largely corresponded to the responses elicited by the peptides in T cell proliferation assays (Table II⇓). In the case of TCL CD 429, this TCL was highly responsive to γ-I peptide-pulsed APC, whereas the staining with the corresponding multimers gave few cells with high staining intensities. The control peptide (HLA class I) is a dominant natural ligand of DQ2 and hence already expressed by the APC used in our experiments (32). No external peptide was thus added to the culture where T cell reactivity to this peptide was tested. An astrovirus-specific TCL from a DQ2+ individual not having CD (TCL CTRL) was used as a control cell line and did not stain with any of the peptide-DQ2 multimers (Fig. 5⇓). Staining of TCCs from CD patients. A, The TCC 4.66 was stained by the γ-I- and control-DQ2 multimers for 5, 15, 30, and 60 min at 37°C and the mean fluorescence intensities at the different time points is depicted. B, Gliadin peptide-specific TCCs were stained by the γ-I-, α-I-, α-II-, and control-DQ2 multimers for 30 min at 37°C. Staining of TCLs. The multimers with gluten specificities and control peptide were used to stain TCLs from DQ2+ CD patients (TCL CD 430, 431, 433) and a DQ2+ normal control (TCL CTRL). All viable cells were gated and analyzed for multimer staining. The percentage of multimer-positive T cells of all cells is given in the upper left corner of each dot plot, and the multimer used is indicated in the lower right corner. The level of TCRs expressed in the cell surface of T cells is influenced by activation stimulus, and we wondered whether an Ag-induced receptor down-modulation could influence the binding of multimers. To examine this we activated TCC 4.66 with different concentrations of the γ-I peptide presented by DQ2-expressing APCs and used an irrelevant peptide (native sequence of the α-I peptide) as a control. The staining by multimers on day 1 was dramatically reduced after challenge by antigenic peptide but not by the irrelevant peptide (Fig. 6⇓A). The reduction in staining intensity obtained with the multimers reagent was equivalent to the reduced staining with the TCR-specific Ab. The higher the concentration of the antigenic peptide used in the assay the more extensive the down-modulation of the TCR and, consequently, the poorer the multimers stained the activated cells. Furthermore, we analyzed the dynamics of the receptor up-regulation and the concurrent improvement of multimer staining by repeating the analysis on days 2, 3, 5, and 8 (Fig. 6⇓B). Throughout the experiment, the reactivity of the multimers strongly related to the level of TCR cell-surface expression. We observed that the highest antigenic peptide concentration induced a faster (and probably greater) down-regulation than the lower concentrations of peptide. On the contrary, low Ag concentration resulted in a more rapid reappearance of the TCRs than when exposed to the highest Ag dose. In our experiments, at the highest peptide concentration the multimers staining intensity did not return to the preactivation level even after several days. Staining of an activated TCC. A, Staining of mixed TCC 4.66 and irradiated APCs on day 1 after incubation with different concentrations of the γ-I peptide or an irrelevant peptide. The γ-I-DQ2 multimer (upper row) and the TCR (lower row) staining are shown together with the staining of CD4. B, The γ-I-DQ2 multimer (upper diagram) and the TCR (lower diagram) mean fluorescence intensities are plotted after incubation of mixed TCC 4.66 and irradiated APCs with different concentrations of the γ-I peptide (filled symbols) or an irrelevant peptide (open symbols) at days 1, 2, 3, 5, and 8 after stimulation. We report in this work the generation of peptide-DQ2 multimers specific for three gliadin epitopes and a control-DQ2 multimer and the use of these multimers to stain specific T cells relevant in pathogenesis of CD. For the production of multimers we used soluble DQ2 molecules where the stability of the DQ2 αβ-heterodimer was facilitated by leucine zipper motifs and covalent linkage of a peptide to the β-chain. The gliadin-DQ2 multimers specifically stained clones and lines derived from CD patients. Following activation of a CD4+ gliadin-specific TCC by APCs presenting the antigenic gliadin peptide we observed that staining was dramatically reduced. We found that the intensity of the multimer staining was critically dependent on the TCR surface expression level. Biochemical studies have indicated that DQ2 is highly susceptible for decomposition into α- and β-chains when exposed to SDS (33, 34). This is in contrast to the behavior of most DR molecules and some DQ molecules, suggesting that DQ2 is fairly unstable. We substituted the transmembrane region of the DQα and DQβ chains by fos and jun leucine zipper domains, respectively, to enhance the stability of DQ2. The acidic and basic zippers specifically adhere and facilitate the formation of αβ dimers (28). In addition, we took advantage of another strategy and genetically engineered a sequence encoding a flexible thrombin linker and a peptide into the construct (29, 30). The peptide coupled to the DQβ chain, in addition to having a stabilizing effect, ensured proper loading of the DQ2 molecules. The yields of the soluble peptide-DQ2 molecules were relatively low. This was a general finding independent of which cell line (Sf9, Hi-Five, or expresSF+) we used and independent of which viral recombinants derived from the same constructs we used. ExpresSF+ cells were chosen because they were easy to grow in large cultures under serum-free conditions which avoided contamination of the DQ2 preparations by serum proteins. Properties of DQ2 itself could be responsible for the low yield of the soluble complexes, but the sequence of the peptides clearly influenced the production level. The immobilized peptide-DQ2 molecules specifically activated all the TCCs tested in the proliferation assay. This indicates that the molecules expressed are correctly folded and, importantly, that the linker for the peptides does not impose a major hindrance for TCR binding. The two crystal structures of TCR-peptide-MHC class II complexes reported so far found that both the TCRs span nine peptide residues from P-1 to P-8 (35, 36). If this is common to all class II-restricted TCRs, this may indicate that the linker extending the peptide to the C terminus would not be expected to interfere with the TCR binding. Our kinetic data on multimer staining demonstrated that at 37°C an incubation time of 30 min gave optimal staining. A similar incubation time was also used in a previous study with MHC class II multimers (9), but in most studies longer incubation times (1.5–5 h) have been used (4, 5, 7, 8, 10, 11, 12, 13, 14, 15). However, few of these papers have documented the gain of lengthy incubations. The staining intensities for the different TCCs specific for the same peptide-MHC complex varied despite having almost identical levels of TCR expression (data not shown). This is unlikely to be attributable to variation in the multimer reagents themselves, because the intensity of staining for individual clones remained consistent when stained on different occasions. The activation state of the cells is also unlikely to be responsible for this phenomenon, as all the T cells used in this experiment were taken at least 8 days after restimulation and when in a “resting” state. Thus, this phenomenon is likely to reflect differences in affinity of the TCR for the peptide-DQ2 complexes as was recently shown by Crawford et al. (4) using T cell hybridomas and by Reichstetter et al. (14), who observed the same phenomenon for two TCCs which were specific for the same HSV peptide-DQ6 complex. Evidence is accumulating that there exists an array of distinct gluten peptides which are recognized by DQ2-restricted T cells of the celiac lesion. Exactly how many epitopes exist is currently unclear, but there may be more than 10 (Ref. 37 and H. Arentz-Hansen, unpublished observations). Some of these epitopes have been identified in young children, and a study of adult Norwegian patients has indicated that the number of peptides associated with responses in these patients may be relatively limited (21). Analysis with multimers should allow a more detailed understanding of the hierarchy of epitopes in different patients and patient groups. As a first approach to this we have tested polyclonal gut-derived TCLs. We found that the staining of the TCLs mainly correlated with the proliferation data obtained by peptide-pulsed APC in T cell assays. The correlation between stimulation and staining was poor for the TCL CD 429. However, the few multimer-positive cells stained with high intensity, and these might have had a particular high-proliferative capacity. 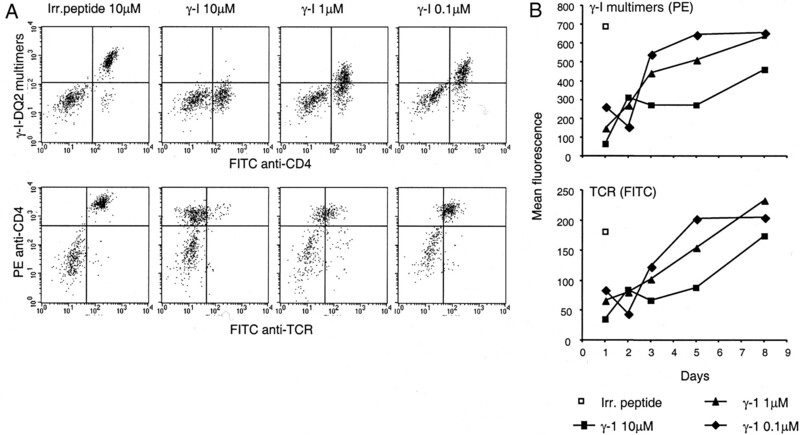 Notably, the spectrum of staining intensities often varied more for the lines than for the clones, which could reflect variation in TCR affinities between different peptide-specific T cells within the TCLs. The TCLs tested in this study were selected for their reactivity to the γ-I epitope so that we were able to demonstrate staining of all three gluten-peptide multimers in the same samples. 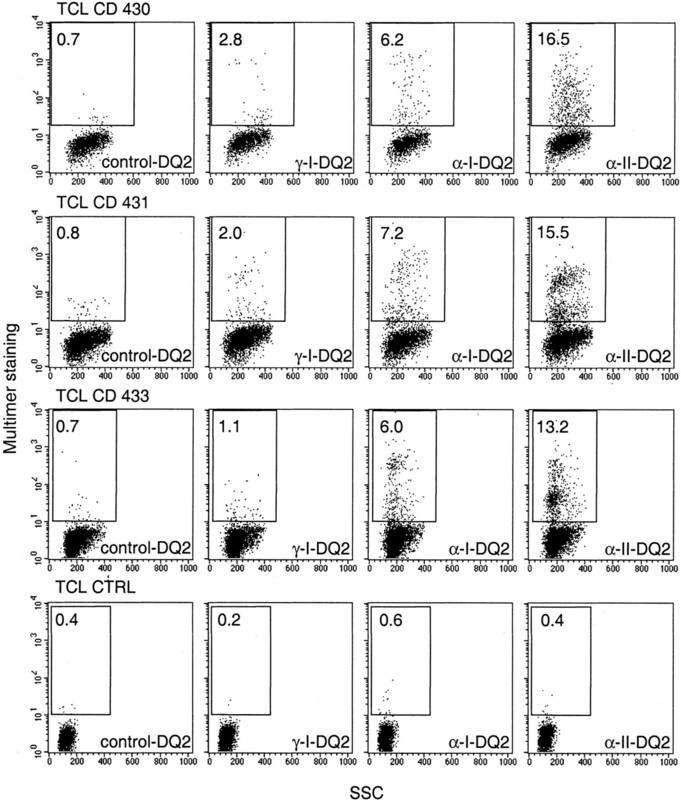 However, the percentage of T cells that were stained with the α-I-DQ2 and α-II-DQ2 multimers was higher than that obtained with the γ-I-DQ2 multimer. This further supports the notion that the two α-gliadin epitopes are important among the epitopes, which are recognized by adult CD patients (17). We found that Ag-induced TCR down-modulation led to poor multimers staining and this reduction in staining was dependent on the Ag concentration used to activate the T cells. These data highlight some important limitations for the application of MHC multimers that should be taken into account when using them in monitoring immune responses. In studying recently activated T cells, there seems to be a period of days where MHC-multimers appear to have reduced potential to stain all Ag-specific cells due to reduced levels of TCRs in the cell surface. Similar findings have very recently been reported for polyoma-specific CD8+ mouse T cells and MHC class I tetramers (38). They found an unexpected discordance between peptide-stimulated T cells producing IFN-γ and staining by tetramers detecting T cells of the same peptide specificity during viral infection. Lack of staining of peptide-specific T cells dependent on the activation state has also been observed for a CD4+ TCL and HLA class II multimers (15). The authors claimed that the effect was independent of TCR down-modulation, but direct evidence demonstrating this was not presented. Initial data from limiting dilution experiments (Ø. Molberg and S. N. McAdam, unpublished observations) suggest that the frequency of gluten peptide-specific T cells in the intestinal lesions of CD patients may be very high and thus suited for direct detection using the DQ2 multimers. However, the staining of biopsy-derived cells is technically more demanding than the staining of TCCs and TCLs because the analysis is performed on heterogeneous cell populations prepared from solid tissue. The future development of robust protocols to purify CD4+ T cells from intestinal biopsies is thus needed. Moreover, in the active lesions present in celiacs on a gluten-containing diet, the peptide-specific T cells are most likely regularly stimulated, so it is conceivable that at the time the biopsy is taken there is extensive down-modulation of the TCRs on the gluten-specific T cells. To be able to determine the precursor frequencies in active lesions these problems have to be solved. In summary, we have generated DQ2 multimers carrying gliadin epitopes that specifically stain T cells recognizing the corresponding gliadin epitopes. The gliadin-DQ2 multimers do not exhibit any cross-reactive staining of DQ2-restricted T cells specific for different peptides, and specific staining for T cells was obtained for polyclonal TCLs derived from gut biopsies of CD patients. The staining of the polyclonal lines mainly correlated with the corresponding proliferative data when stimulated with peptide-pulsed APC. This further supports the concept that there is a hierarchy among the gluten T cell epitopes and that some appear to be more important than others. We also demonstrate that Ag stimulation led to an extensive down-modulation of the TCR cell-surface expression, resulting in impaired multimer staining. This observation has relevance for studies using multimers to characterize gluten-specific T cells that likely are involved in the development of CD. We thank Marie K. Johannessen and Eva Boretti for excellent technical assistance. ↵1 This work was supported by research grants from the Research Council of Norway, the Norwegian Cancer Society, Anders Jahre’s Foundation, and the European Commission (projects BMH4-CT98-3087 and QLRT-2000-00657). ↵3 Abbreviations used in this paper: CD, celiac disease; TCC, T cell clone; TCL, T cell line; SA-R-PE, streptavidin-R-PE; TCL CTRL, negative control TCL.